I based this recipe on a roasted veg & couscous salad I used to buy from Marks & Spencers years ago and always crave this time of year. 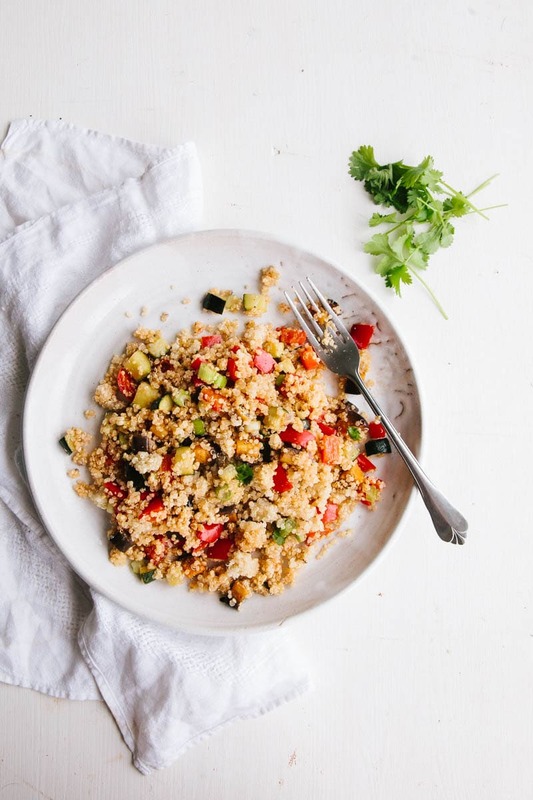 I’ve swapped couscous for quinoa to make this gluten-free (and grain-free!) and used one of my favourite ingredients, harissa paste, to add some spice and flavour to the roasted vegetables. 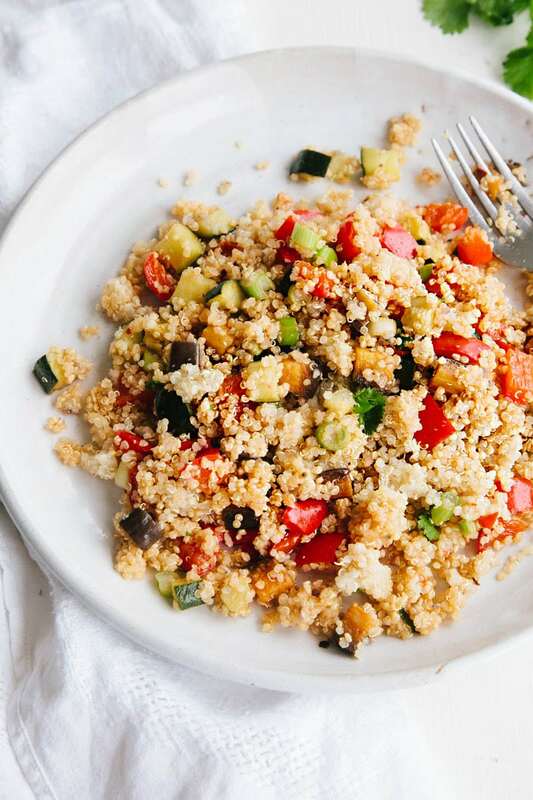 The salad definitely has a Moroccon flavour to it and I can imagine it would be gorgeous with some chickpeas added, I might have to try that next time. 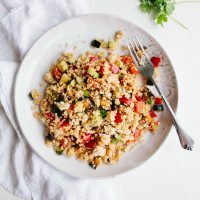 What I love most about this recipe is that it’s so easy to make but you can get quite a few meals out of it! I had a portion eaten hot, as soon as it was cooked. Then I had some for lunch the next day and the day after, straight from the fridge. It’s so delicious, both hot and cold! So feel free to divide up the portions how you wish. It also works great as a side dish to serve at a BBQ or picnic. A flavourful and satisfying lunch that is both delicious & healthy! Mix the veg with the harissa paste and garlic powder so it's well coated. Roast for 20-30 minutes until slightly browned. Meanwhile, cook the quinoa by adding it to a saucepan with the vegetable stock. Cook on a simmer for approximately 15-20 minutes, until it's absorbed all the liquid. Add to a serving bowl and fluff with a fork. Stir in the spring onions and tomato puree. Once the vegetables are cooked, stir them into the quinoa, along with the chopped coriander. You can serve straight away for a hot meal or keep it in the fridge for a cool salad. This is such a beautiful salad, Aimee! I could eat this every day for breakfast, lunch or dinner! I love the harissa pastes in here! Im with you! Lettuce just doesn't float my boat at all. There are so many more interesting and tasty things that can be created into a 'salad'....this looks beautiful and so so tasty! Thanks Lucie, so glad you agree! YUM! 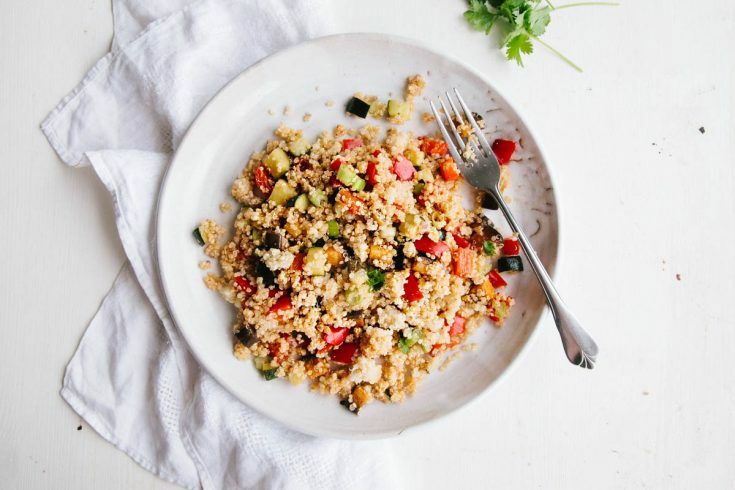 It's been awhile since I've made a quinoa salad...this one sounds perfect for the summer! Delicious! I would happily eat this any day of the week. Love the added heat from the harissa :D PS I had no idea Paleo included quinoa, isn't it a grain? I am imagining this salad with the vegetables grilled! They would be amazing grilled or roasted! Me too, quinoa is one of those grains that always suits me and makes me feel good! And harissa... well, I add that to everything! This is such a lovely light meal! One of those dishes that leaves you feeling nice and nourished! Absolutely! But above all, it's so tasty!